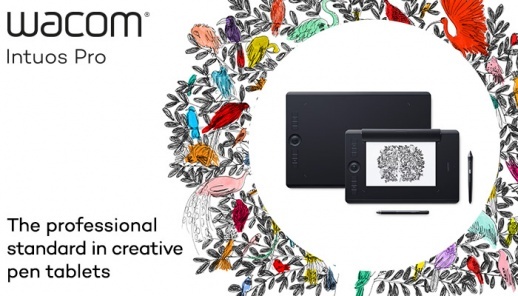 Wacom launches the new generation Wacom Intuos Pro; Medium, Large, Medium Paper Edition and Large Paper Edition. Intuos Pro is the new industry leading line of pen tablets for artists, designers, photographers and enthusiasts who want the most natural accurate and professional creative pen tablet experience with the widest range of creative capabilities. With pressure-and tilt-sensitive technology artists can create with the same precision as they would have with traditional pens and brushes. Multi-touch feature, ExpressKeys and Keyring makes it possible for users to navigate intuitively. * Pen technology with the most natural experience and 4X higher pressure sensitivity than before. Sketch anywhere with your favorite paper on Intuos Pro Paper with the included Finetip Pen. A digital copy of your sketch can be saved on the tablet and possible to transfer to a Mac or PC when connected. * Connect Intuos Pro to a computer and finalize your digital art using leading creative 2D and 3D software on a Mac or PC (transfer your saved sketch via Bluetooth or USB). * Optimized for creativity with multi-touch control, shortcut Express Keys, TouchRing let you create faster and more naturally.